Cesc, as Fabregas is fondly known, has been one of world football’s most exciting playmakers for a number of years now. He made his name in world football in the years spent at Arsenal, where he joined the Academy in 2003. When he finally left Arsenal for Barcelona in 2011, he had firmly established himself as one of the world’s leading midfielders. Cesc Fabregas was born into a family of Barcelona supporters in 1987. Aged 10, he was signed by his favorite club’s youth academy, the famed La Masia. Despite his prolific goal scoring records for the youth teams he never managed to break into the Barcelona first team. It was in 2003, as a 16 year old, that Cesc made the difficult decision of leaving his boyhood club in search of regular playing time at the top level. He left to join Arsenal in North London. Although he did not break into the first team immediately, Cesc did become Arsenal’s youngest ever first team player and their youngest ever first team goal scorer. Both these records came in matches in the League Cup. It was only in 2004-05, after the departure of Patrick Viera, that Cesc became a regular starter. At the start of the 2008-09 season, Fabregas was named club captain, a reward for his excellent performances. Barcelona, in the meantime had tried unsettling their former player with a number of bids which were all rejected. but he was criticized by the Catalan media for being unable to reproduce the form he showed in the reds of Arsenal. The start of the 2013-14 season has seen Cesc play some of his best football in a Cules shirt. After 13 appearances in La Liga, he leads the league’s assists chart having created 8 goal scoring opportunities. 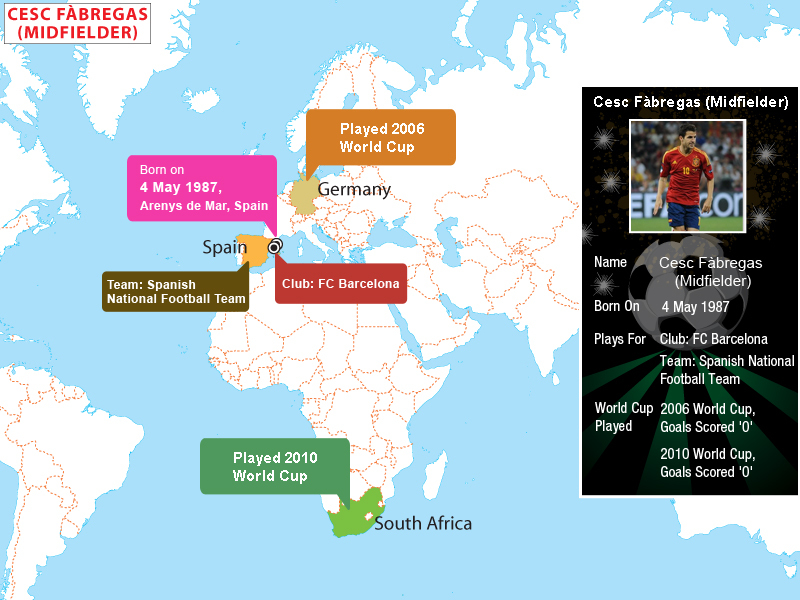 Like others in his generation, Fabregas came into the national side after having appeared for the various junior teams. 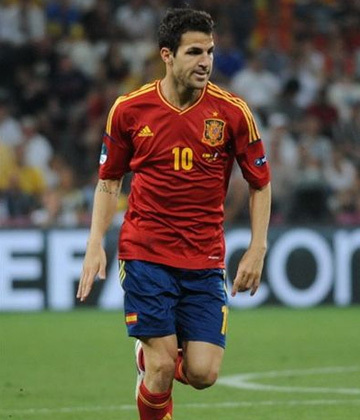 When he made his senior debut in a friendly against Ivory Coast, Cesc became the youngest player to do so in 70 years. In the 2006 World Cup, he became the youngest player in the history of the national side to play in a World Cup match. He was nominated for the Gillette Young Player of the Tournament, although he didn’t end up winning. Since then, he has gone on to lift two European Championships and a World Cup with La Roja. That Cesc Fabregas has played an integral part in both of Spain’s victories at the European Championships is shown by the fact that UEFA named him in the Team of the Tournament on both occasions. He was also part of the XI named by the same institution for the club seasons of 2006 and 2008. He has also been voted Young Player of the Year by the PFA in 2007-08. As a La Masia student, Fabregas idolized the then Barcelona captain, Pep Guardiola growing up. Guardiola, once, even gifted Fabregas one of his shirts to cheer him up after his parents’ divorce. In the U-17 FIFA World Championships, Cesc, despite playing as a midfielder, won the Golden Shoe as well as the Golden Ball, the awards given to the top scorers and best players of the tournament. It is now claimed that Fabregas played the role of pantomime villain in the now infamous “Battle of the Buffet”. In the aftermath of Manchester United’s 2-0 win over Arsenal at Old Trafford in 2004, tempers flared and, it is reported, a number of food items were thrown at United manager, Sir Alex Ferguson. It is claimed that Cesc was the one who threw the pizza at Sir Alex causing outrage in the United camp. A difficult close season and summer seems to have galvanized Fabregas for the new season. He has hit the ground running and has, arguably, been Barcelona’s best player this season. With Spain’s "capture" of Diego Costa coupled with the good form of Fernando Llorente and Alvaro Negredo, it will be interesting to see where Cesc is fitted in the national team. Coach Vicente Del Bosque is sure to keep a keen eye on him throughout the course of the season.